At a recent Long Now seminar, Ed Moses mentioned in passing that we now produce enough bullets each year to kill every person on the planet — twice. We are a violent species; we hunt, we organize in gangs, we go to war. Today the U.S. is prosecuting two wars, and there are hotspots around the world from Darfur to Mexico. At the same time, global defense spending is rising by 8% a year. We face unquantifiable threats from nuclear, biological, and robot weapons. And, of course, there will almost certainly be new conflicts over food, water, and other resources. Over the long term, it’s possible that war may actually be on the decline. 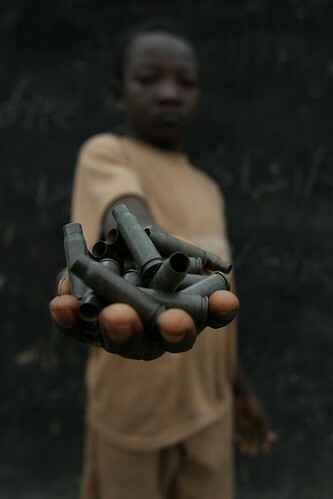 The UN defines a “major war” as an armed conflict which causes more than 1,000 violent deaths a year. Just ten years ago, the world had fifteen major ongoing wars. Today there are seven. In fact, Steven Pinker has argued that if you’re a young man (the group most likely to bear the burden of soldiering), your chances of dying in an armed conflict are lower than at any time in history: “If the wars of the twentieth century had killed the same proportion of the population that die in the wars of a typical tribal society, there would have been two billion deaths, not 100 million.” His essay is a few years old, but it’s worth reading if you haven’t seen it before: A history of violence.